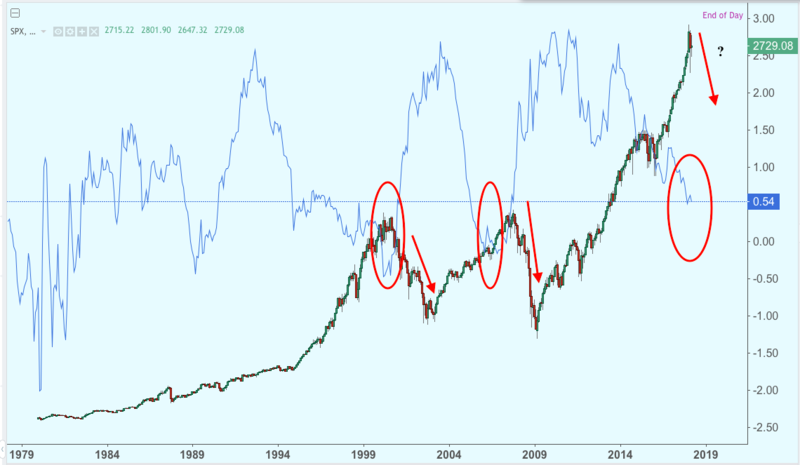 Home › Market notes › 10YR-2YR Treasury spread – what it means for the market? 10YR-2YR Treasury spread – what it means for the market? Why we consider BTCUSD bullish? It’s the result of G20 meeting where world financial leaders decided to loose grip on cryptocurrencies and after period of drawdown and then purgatory phase large investors may consider adding more crypto in their portfolio. Also crypto market proved to be resilient to FUD and complete market collapse, holding levels quite above of the last year. The bond market has a much greater impact on the economy than the stock market, especially in the United States since US companies rely chiefly on debt financing rather than by selling stocks. Often a bad tendencies on it precedes the reversal of stock market indices, and their drop or rally leads to the decline/rebound of the GDP as it dampens the value of savings of Americans which is mostly held in equity securities. In a normally working economy, the cost of short-term borrowing is cheaper than long-term debt rate because of risk-premium. However, when things get heated, the yields on short-term and long-term bonds lose difference, i.e. 10YR-2YR Treasury spread narrows. Investors doesn’t care about time and start to hunt for higher yields. There is a kind of pattern that during the growth phase on stock markets, the spread between “long” and “short” bonds falls and vice versa. So it was in the periods from 2002 to 2007, from 2008 to 2009, from 2011 to the present. Before the crisis of 2007-2009. the spread between the yields for 30-year and 10-year US government bonds fell below 0.2 percentage points and slightly recovered just before the very beginning of the stock market collapse. Today, the 10YR-2YR Treasury spread has approached the critical level and may soon fall lower, especially since the Fed has begun to reduce its balance sheet and intends to raise the rates at faster pace than anticipated. In turn, the shrinking 10YR-2YR Treasury spread will not immediately mean the correction on stock markets. At the turn of the century, it took 1.5 years to begin the correction, and two years before the “mortgage crisis”. Therefore, it is still early to speak about the impending collapse of American stock markets, but the time “x» is looming. In our opinion, the stock market movements in the coming years will be much more nervous and erratic than it was in 2017. 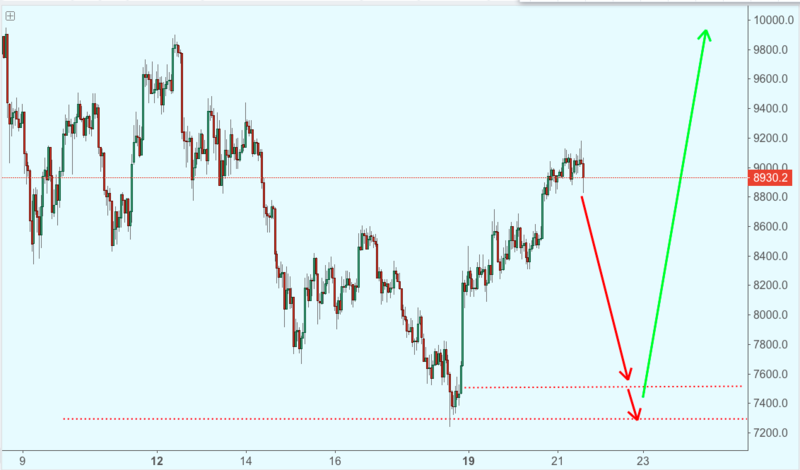 From this perspective, the US Dollar forecast is bearish since foreign investors will be wary of adding more US stock market bets to their portfolio what in turn means weaker demand for US currency. What happens with the oil market? The United States is slowly but surely ramping up its oil output and exports – in 2017 it almost doubled after long period of limbo because of exports ban introduced in the last century. Last year, the average daily export of oil from the US almost doubled compared to 2016, rising to 1.1 million barrels a day, reported EIA. Clearly the US wants to become well-anchored crude oil player on the market landscape. In addition to the exports increase, the consumer list has also expanded. From 2016 to 2017 the number of oil buyers rose from 27 to 37 countries. Biggest part of foreign oil shipments accounts for Canada, totaling with 29% of all exports from the United States. In second place, China, which is buying roughly 202K barrels of oil overtaking Britain and the Netherlands in terms of imports of American “black gold”. 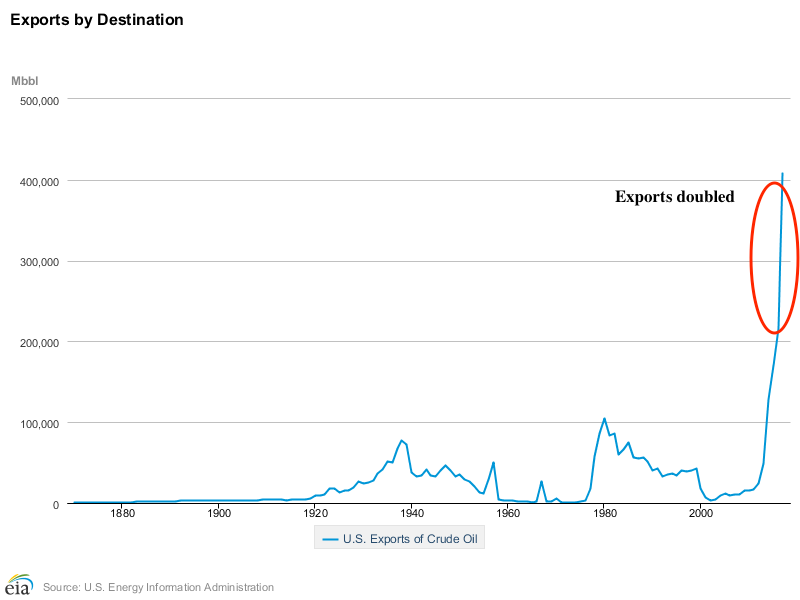 Share of oil in US exports advances averaging for about 18% of the total export. The EIA also noted that the country is intensely constructing pipelines and improving the infrastructure for oil exports, which paves the way for flat out output expansion. The full-blown infrastructure upgrades are being made in Permian Basin in Texas and New Mexico. Russia supplies around 15% of the world’s total oil exports, Saudi Arabia accounts for biggest oil shipments with 21% share. The United States supplies only 3%, doubling from 1.5% that was in 2016. This year, according to estimates by the EIA, the average annual oil output in America should increase by 1.4M barrels per day peaking at 11M barrels per day. Part of this oil will be domestically consumed while the rest will be exported. In our view, the average annual foreign supplies of crude oil from US may increase by another 50-100%. In this case, the share of “black gold” from the United States will reach 4.5-6%.